DETROIT (The Sports Xchange) - Matt Prater's 40-yard field goal on the final play gave the Detroit Lions a 16-13 victory over the Minnesota Vikings and sole possession of first place in the NFC North on Thanksgiving Day at Ford Field. Detroit, MI, USA; Minnesota Vikings running back Matt Asiata (44) breaks a tackle from Detroit Lions strong safety Tavon Wilson (32) for a touchdown run during the first quarter at Ford Field. Minnesota Vikings quarterback Sam Bradford (8) drops back to pass during the first quarter of a NFL game on Thanksgiving against the Detroit Lions at Ford Field. Detroit Lions quarterback Matthew Stafford (9) looks to pass during the first half of an NFL football game against the Minnesota Vikings in Detroit, Michigan USA, on Thursday, November 24, 2016. Detroit Lions wide receiver Golden Tate (15) is tackled by Minnesota Vikings free safety Harrison Smith (22) during the first half of an NFL football game in Detroit, Michigan USA, on Thursday, November 24, 2016. Detroit Lions punter Sam Martin (6) holds the ball as kicker Matt Prater (5) kicks the game winning field goal as time runs out during the fourth quarter against the Minnesota Vikings at Ford Field. The Lions won 16-13. Aretha Franklin sings the national anthem during the NFL football game between the Minnesota Vikings and Detroit Lions on Thanksgiving Day November 24, 2016, at Ford Field in Detroit, Michigan. Detroit Lions fans in Thanksgiving costumes cheer during the first quarter against the Minnesota Vikings at Ford Field. Detroit Lions kicker Matt Prater (5) watches his game winning field goal as he stands over Minnesota Vikings cornerback Trae Waynes (26) during the fourth quarter at Ford Field. The Lions won 16-13. Minnesota Vikings running back Matt Asiata (44) celebrates after a touchdown during the first quarter against the Detroit Lions at Ford Field. Minnesota Vikings tight end Kyle Rudolph (82) is wrapped up by Detroit Lions strong safety Miles Killebrew (35) during the first half of an NFL football game in Detroit, Michigan USA, on Thursday, November 24, 2016. Detroit Lions kicker Matt Prater (5) celebrates after kicking the game winning field goal during the fourth quarter of a NFL game on Thanksgiving against the Minnesota Vikings at Ford Field. Kicker Matt Prater (5) of the Detroit Lions leaves the field after kicking his third field goal to defeat the Minnesota Vikings at Ford Field on November 24, 2016 in Detroit, Michigan. 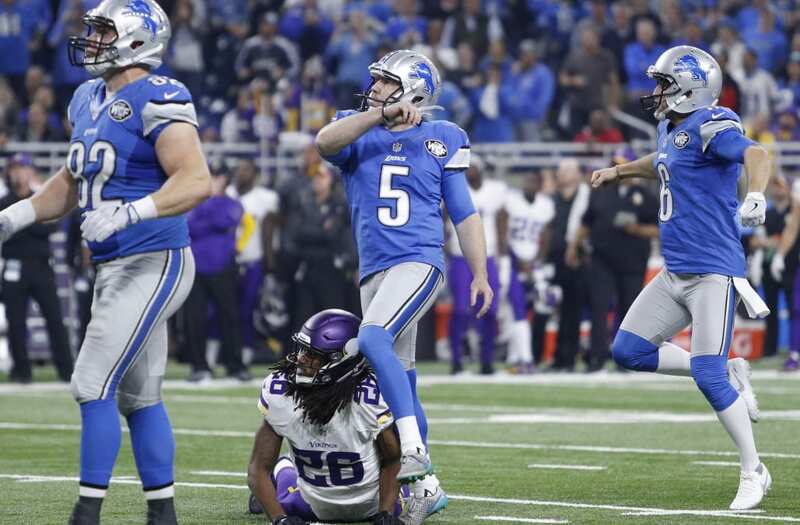 The Lions kicked a field goal as time ran out to defeat the Minnesota Vikings 16-13. The Green Bay Packers got bested 42-31 by the Cowboys in 1994, but it was a person on the losing team that stole the show. Packers wide receiver Sterling Sharpe dominated the game to the tune of nine catches for 122 yards and four touchdowns. As if his day wasn’t impressive enough, the Packers as a team had only 277 yards of total offense, so Sharpe himself accounted for nearly half their offense. It’s a shame his effort wasn’t good enough for a win. It probably speaks to Sanders’ greatness that this performance isn’t higher up on the list. In 1977, Sanders’ Detroit Lions annihilated the Bears 55-20. While the game itself didn’t look that entertaining, Sanders put on a side show on his own when he rushed for 167 yards and three touchdowns. It was just another day at the office for one of the game’s greats. I hope you’re not tired of seeing the Packers and Lions already. In 1986, Stanley’s Packers and the Lions had an amazing battle that went down to the very end. Stanley finished for four grabs for 124 yards and two touchdowns, and while that would have been a good day on its own, it was what he did on special teams that has him on this list. With just 41 seconds left, Stanley returned a punt 83 yards for the go-ahead score and the Packers would go on to win 44-40. Both teams failed on fourth-down conversions later in the quarter.